If you have seen a Burberry diaper bag that you want to buy as a special treat for yourself and baby, you will quickly find that Burberry is designer brand that could by no means be considered as "cheap". As a mother who admits to having champagne taste on a soda pop (and at times a tap water) budget I found this out the hard way when out shopping at the mall a stunning Burberry baby bag caught my eye. HOW MUCH DOES A BURBERRY BABY BAG COST? 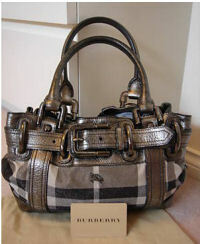 The mental picture of that cute Burberry diaper bag haunted me the rest of the day. The minute that my baby girl was tucked into her crib that evening, I raced to the computer to see if I could identify the bag on a site that had Burberry baby products for sale to see how much this item cost and if I could see my way clear to buy one and to see if it came with a matching wallet. I quickly saw that I had fallen in love with a diaper bag whose retail price was over $1,000.00. OUCH! 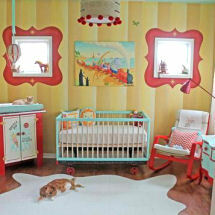 I admit that my taste runs toward expensive designer brands and I’ve been known to pay more than I should for my baby’s clothes, nursery items and gear. But there is no way that I could justify paying full retail price for my latest obsession which was to my thinking the most beautiful Burberry diaper bag that had ever hung on a stroller handle. The answer to this dilemma was to do my research and find a resource for a seller or store that sold Burberry baby products with the lowest prices on Burberry for baby in the whole wide world. If the thought of spending a week's salary for a designer label brings you to your knees (as it certainly does most of us) you might want to buy some cheap Burberry plaid fabric and make your own diaper bag. There are free patterns for totes all over the web and just as many used articles of clothing with that one tiny tear or stain that prevents them from being sold for top dollar. This gives thrifty ladies the opportunity to pick up yards of material for sewing that would otherwise cost ten times as much! There are die-hard fans of the genuine article that prefer to budget for months, saving a little at a time until they have the cash and are willing to wait for end of season discount sales to buy an authentic Burberry diaper bag. If you have your little heart set on a genuine Burberry head over to check out the online auctions or to the local consignment or even a thrift store. 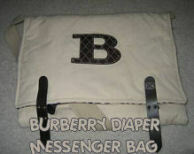 You might luck up on the exact quilted Burberry diaper bag that you want to buy at a deep discount right there on Ebay. They are often priced at a fraction of full retail just be sure to request pictures that give you a clear view of both the interior and exterior of the baby bag. 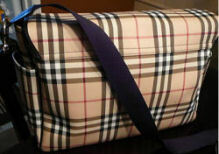 I got lucky and found my dream Burberry diaper tote on Ebay used and saved a ton of money. To gamble on whether I could find this Burberry diaper bag on sale at the end of summer was not a risk that I wanted to take so I possibly paid a little more for a used messenger bag but I will get more use out of it and I will rack up a few more months of envious glances from other moms. The diaper bag was bought for its looks but is it just another pretty bag or does it have all the bells and whistles (or zippers, pockets and storage capabilities) that we have come to expect? Stay tuned for a review on my precious Burberry diaper bag or better yet, use the form below and submit your own opinions and reviews and then return to Unique Baby Gear and Nursery Ideas to check out some of the exquisite Coach baby diaper bags that are just as stylish and slightly less expensive than Baby Burberry.